Twenty years in the making by a distinguished dolphin expert and his associates, The Hawaiian Spinner Dolphin is the first comprehensive scientific natural history of a dolphin species ever written. From their research camp at Kealakeakua Bay in Hawaii, these scientists followed a population of wild spinner dolphins by radiotracking their movements and, with the use of a windowed underwater vessel, observing the details of their underwater social life. 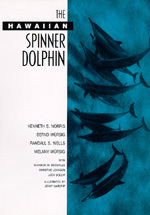 The authors begin with a description of the spinner dolphin species, its morphology and systematics, and then examine the ocean environment, the organization of dolphin populations, and the way this school-based society of mammals uses shorelines for rest and instruction of the young. The dolphins' reproductive cycle, their vision, vocalization, hearing, breathing, and feeding, and the integration of the school are carefully analyzed. The authors conclude with a comprehensive evolutionary analysis of this marine cultural system, with its behavioral flexibility and high levels of cooperation. This absorbing book is the richest source available of new scientific insights about the lives of wild dophins and how their societies evolved at sea. Kenneth S. Norris is Emeritus Professor of Biology at the University of California, Santa Cruz, co-editor of Dolphin Societies (California, 1990), and author of the award-winning Dolphin Days (1991). Bernd Würsig is Professor of Marine Mammalogy at Texas A & M University, where Melany Würsig is a research associate. Randall S. Wells is a conservation biologist with the Chicago Zoological Society. Shannon M. Brownlee is Senior Editor for Science at U.S. News and World Report. Christine Johnson teaches in the Department of Cognition at the University of California, San Diego. Jody Solow is a doctoral candidate in geography at the University of Cambridge. Jenny Wardrip is a freelance illustrator and a lecturer at the University of California, Santa Cruz.